A big thanks to all my blokes in England! No. 37? Next to Louis L’Amour?! There’s quite an interesting phenomenon going on with “Little Man, and the Dixon County War” in England. In short, it’s selling like crazy. 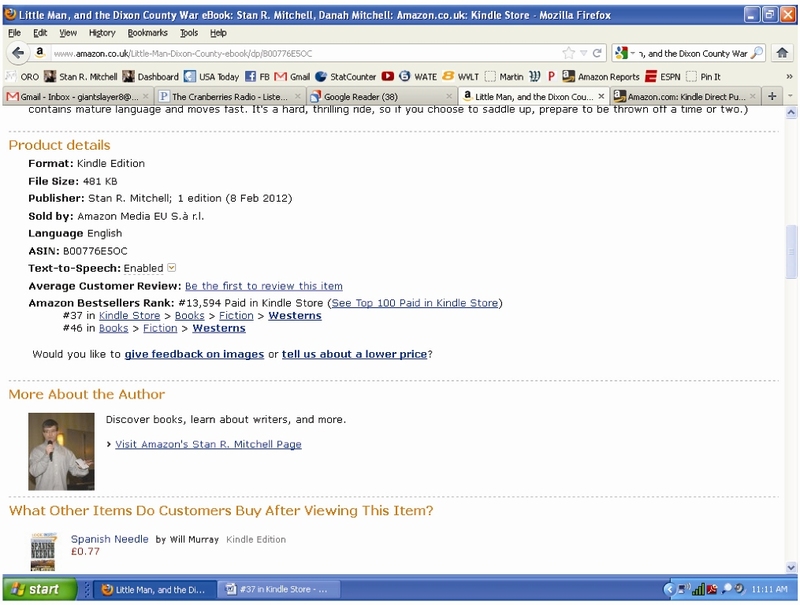 I woke up on Friday, checked my sales like I do every morning, and saw it had already sold two more books there. I mean, what are the chances of that?! And in what, like two months, with no real promo? And yet, it’s so improbably that I couldn’t just let this oddity go. Surely some blogger must be pushing me, right? Or, mentions on some website or something? So, I spent probably five minutes searching every possibility of my name and the book name on UK pages, and yet nothing.At least, nothing that I could find. I don’t think there’s any way my book should be that high, given the fact that Louis L’Amour has written 89 novels and sold more than 320 million copies — not to mention owns one of the most recognizable names in the literary world and has put out a lifetime of work. And yet, there’s one thing that I think I do have over him. Thus, when I wrote “Little Man, and the Dixon County War,” I did all I could to cram in the action and cut out the crap. As I stated in the Author’s Note on Amazon, if you’re looking for a typical Western, don’t waste your money on this book. There are no cattle drives or beautiful sunsets. No slow scenes with formal manners and tender dames. And while my brutal Author’s Note and foul language has gotten me shunned in the Western World and kept me out of their magazines and the like, it seems to still be working out all right. Because apparently people want what I want: A great story that takes us out of this world and into something far more exciting. 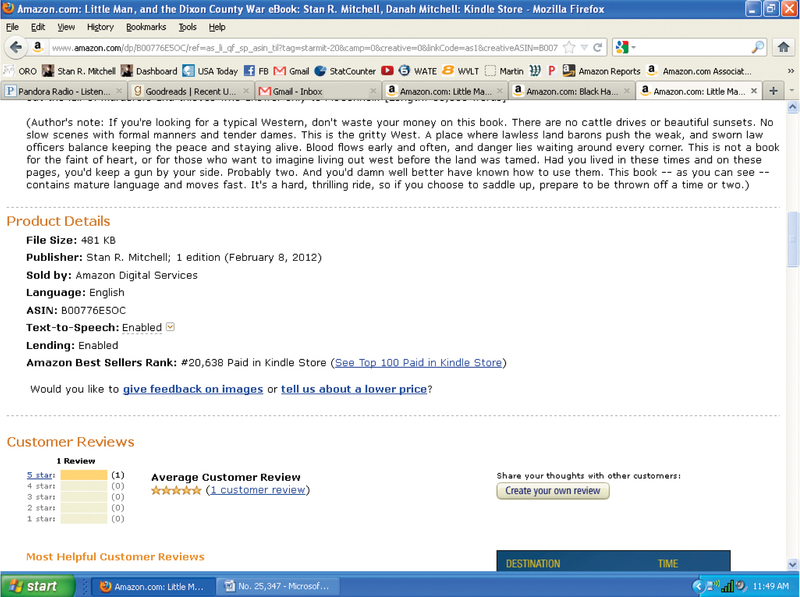 So, to all the folks in England buying my book and recommending it by word of mouth, I say thanks. Thank you for making my day, if not my year. Hell, maybe my life. On the same page as Louis L’Amour?! Are you kidding me?! Somebody wake me up. No, better yet, don’t. This dream’s worth enjoying. P.S. Want to read a crazy good, fast-moving, shoot-’em-up novel? Then go buy “Little Man, and the Dixon County War.” It’s gone as high as below 21,000 on the Amazon paid Kindle list — no small accomplishment — and the reviews say it rocks. Don’t have a Kindle? Read it from your computer, laptop, ipad, phone, or other device. Click here for free download. That’s every writer’s dream! I won’t wake you! Keep selling! Thanks, Cindy! How’s your latest project going? And remind me what it’s about?